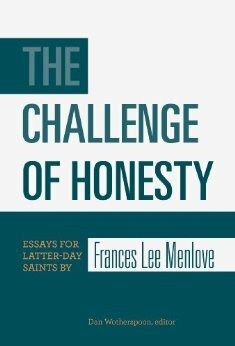 One of the factors that sometimes impedes private honesty is “the myth of the unruffled Mormon.” This myth is simply the commonly held picture of Mormons as complete, integrated personalities, untroubled by the doubts and uncertainties that plague Protestants and oblivious to the painful searching and probings of non-believers. Mormons are taught from Primary on up that they, unlike their non-Mormon friends, know with absolute certainty the answers to the knottiest problems of existence, that in fact their search has come to an end and that their main task in life it to present these truths to others to that they too may end their quests. In reality, Mormons are also subject to uncertainties and doubts….Those who blot out internal awareness in order to maintain to themselves and to others the appearance of absolute certainty, who refuse to examine their inner lives, may all too often settle for the appearance of a Christian believer rather than for its actuality…. As a huge sports fan, this last comment made me realize I probably spend too much time worrying about BYU (and Utah’s) football teams. She continues by taking to task both liberal and conservative theologians. Religious liberals are generally thought to be those who examine their religious lives and their church frankly and openly, recognize the weaknesses and incongruities where they exist, and comment freely on their observations. They are often able to be candid in their criticisms and zeal for change, while at the same time remaining active in Church organizations and maintaining a respected place in the Mormon community. Their potential for inner deception here lies in the possibility that they will use their candidness, their frank and often entirely justified criticisms and demands for change, as a smoke screen for their more basic religious problems. They may be using their dissatisfaction with particular organizational procedures, or manifestations of authority or theological interpretations, as scapegoats to help them avoid facing the issues that are of real concern to them–perhaps about the very nature of the Church organization or the legitimacy of any expression of authority or the validity of the basic theology. In this way, they are relieved from coming to terms with themselves. Similarly, religious conservatives have their particular pitfalls. In their desire to preserve and protect, they may become indiscriminate and fail to make important distinctions between historical accidents and timeless truths. They may defend with equal vigor anything that is blessed with age, effectively freezing the form in which the gospel may be expressed. The particular type of personal dishonesty that is possible here is that conservatives may be acting not in faith and love but from a basic lack of interest. They may simply not want to go to the trouble of questioning and sorting. Behind the mask of fanatical preservation may be the real fear that the truth of the Church is too fragile to tamper with, that an honest and open examination may destroy their faith or way of life. Thus, religious conservatives may also be hiding from themselves a basic lack of faith. Is anyone spared from inner deception? No. We are all victims…and perpetrators. But who did he come for? The ungodly. Real sinners. The kind we know that we are.